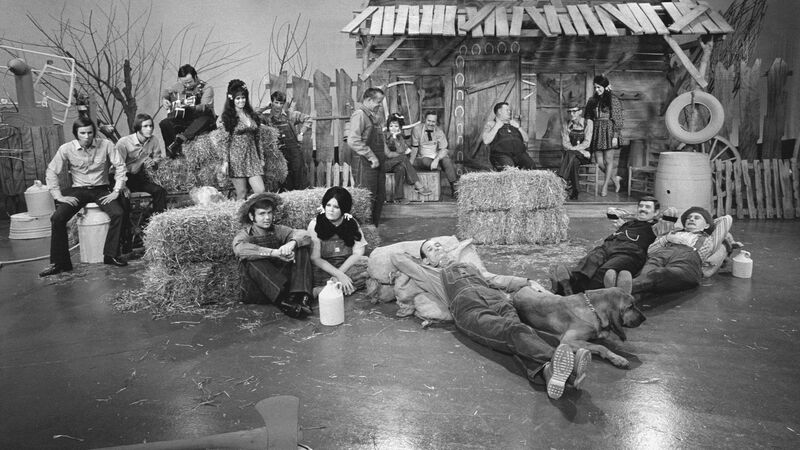 Here's where to watch every episode of Hee Haw season 3. Mouseover or tap an episode to see where to stream it. Click or tap the play icon to stream it on the best available service. Ep. 55: George Lindsey, Kenni Huskey Oct 9, 1971 Roy Clark and the whole Hee Haw gang - "Old Time Religion" Kenni Huskey - "Living Tornado" Buck Owens and the Buckaroos - "I Ain't Gonna Be Treated This A-Way" George Lindsey - "That There's Big with Me" The Hagers - "Back Out on the Road Again" Roy Clark - "Hangin' On" Buck Owens - "Roll In My Sweet Baby's Arms" Junior Samples - "Doggone, My Dog's Gone"Sketches include several installments of "Moonshiners", "Dr. Campbell", "The Cornfield", "Pfft, You Was Gone", "Archie's Barbershop" and "Samuel B. Sternwheeler". Also, "Gordie's General Store", "Paulene and Pierre", "Hey Grandpa, What's for Supper? ", "Pickin' and Grinnin'", "KORN News", and Stringbean reads a letter from home. Ep. 56: Conway Twitty, Loretta Lynn Oct 16, 1971 Buck Owens and the whole Hee Haw gang - "Truck Driving Man" Loretta Lynn - "I Wanna Be Free" Roy Clark - "For the Good Times" Conway Twitty - "Hello Darlin'" Buck Owens, Don Rich and the Buckaroos - "Uncle Pen at Home" The Hagers - "California on My Mind" Roy Clark and the whole Hee Haw gang - "Pig at Home in the Pen" Gordie Tapp - "Minnie Others" Conway Twitty and Loretta Lynn - "Pickin' Wild Mountain Berries" Buck Owens - "Rocky Top"Sketches include several installments of "Gordie's General Store", "The Cornfield", "Samuel B. Sternwheeler", and "Moonshiners". Also, "Dr. Campbell", "Paulene and Pierre", "Pfft, You Was Gone", "Claude Strawberry, the Country Poet", "Archie's Barbershop", "Samples Sales", "The Culhanes", "Hey Grandpa, What's for Supper? ", "Pickin' and Grinnin'", "KORN News", and Stringbean reads a letter from home. Ep. 57: Sammi Smith, Bakersfield Brass Oct 23, 1971 Sammi Smith - "Help Me Make It Through the Night" Bakersfield Brass - "Yakkety Sax" Buck Owens - "Salty Dog Blues" Roy Clark - "She Cried" The Hagers - "Freight Train Fever"
Ep. 58: Lynn Anderson, Ray Sanders Oct 30, 1971 Lynn Anderson - "Rose Garden" Lynn Anderson - "You're My Man" Roy Sanders - "I'm Gonna Walk All Over Georgia" Buck Owens - "Mountain Dew" Roy Clark - "My Goal for Today"
Ep. 59: Roy Rogers and Dale Evans Nov 6, 1971 oy Clark and the whole Hee Haw gang - "Out Behind the Barn" Dale Evans - "What the World Needs Now" Buck Owens and the Buckaroos - "The Kansas City Song" Roy Rogers - "Happiness" The Hagers" - "Mercedes Benz" Buck Owens - "I Am a Rock" Roy Clark - "That's All That Matters" Roy Rogers and Dale Evans - "Have I Told You Lately That I Love You?" Buck Owens and the Buckaroos "I Ain't a Gonna Be Treated This Way"
Ep. 60: Dale Robertson, Kenni Huskey Nov 13, 1971 Music includes: Dale Robertson - "Okie from Muskogee" Kenni Huskey -- "Within My Loving Arms" The Hagers - "Break My Mind" Buck Owens - "Johnny B. Goode" Roy Clark - "Fireball Mail"
Ep. 61: Conway Twitty, Loretta Lynn Nov 20, 1971 Music: Roy Clark and the whole Hee Haw gang - "Born in East Virginia" Loretta Lynn - "When You're Poor" Buck Owens and the Buckaroos - "Who's Gonna Mow Your Grass" Conway Twitty - "I Wonder What She'll Think About Me Leaving" The Hagers - "Fort Worth I Love You" Susan Raye - "Pitty Pitty Patter" Buck Owens and the Buckaroos - "Corn Liquor" Roy Clark - "I Remember Loving Someone" Conway Twitty and Loretta Lynn - "After the Fire Is Gone" Buck Owens and the Buckaroos - "Ole Slew Foot"Sketches include several installments of "Dr. Campbell", "Moonshiners", "The Cornfield", "Gordie's General Store", "Samuel B. Sternwheeler" and "Pfft, You Was Gone". Also, "Paulene and Pierre", "Claude Strawberry", "Archie's Barbershop", "Samples Sales", "The Culhanes", "Hey Grandpa, What's for Supper? ", "Pickin' and Grinnin'" and Stringbean reads a letter from home. Ep. 62: Sammi Smith, Buddy Alan, The Bakersfield Brass Nov 27, 1971 Music: Buck Owens and the whole Hee Haw gang- "Sam's Place" Sammi Smith - "Mr. Bojangles" Roy Clark - banjo instrumental Buddy Alan - "I Will Drink Your Wine" The Bakersfield Brass - "Flinthill Special" Buck Owens and Buddy Alan - "You're a Real Good Friend" The Hagers - "Joy to the World" (a.k.a. "Jeremiah Was a Bullfrog") Sammi Smith - "Then You Walk In" Roy Clark - "Back in the Race" Buck Owens and the Buckaroos "Rocky Top Tennessee"Sketches include several installments of "Dr. Campbell", "Moonshiners", "The Cornfield", "Gordie's General Store", "Samuel B. Sternwheeler", and "Pfft, You Was Gone". Also, "KORN News", "Archie's Barbershop", "Samples Sales", "Hey Grandpa, What's for Supper? ", "Paulene and Pierre", "Pickin' and Grinnin'" and Stringbean reads a letter from home. Ep. 63: Lynn Anderson, Ray Sanders Dec 4, 1971 Music includes: Lynn Anderson - "Stay There Til I Get There" Ray Sanders - "All I Ever Need Is You" Buck Owens - "Night Train to Memphis" Roy Clark - "Say Amen" The Hagers - "Floating"
Ep. 64: Susan Raye, Buddy Alan Dec 11, 1971 Music: Susan Raye - "I Got a Happy Heart" Susan Raye and Buck Owens - "We're Gonna Get Together" Buddy Alan - "Lookin' Out My Back Door" Buck Owens and Buddy Alan - "Wham-Bam" Roy Clark - "Mary Ann Regrets"